Les Babettes sono nate nel 2011 a Trieste, una piccola città di mare con una grande storia, anche musicale. Il loro nome è un omaggio alla città: le “babe”, o “babette”, sono infatti, nel dialetto cittadino, le ragazze che spettegolano. Con un pizzico di ironia il trio ha modificato questo buffo termine dialettale conferendogli un tocco di eleganza francese e rendendo così omaggio anche ad alcuni famosissimi gruppi vocali del passato (The Chordettes) o del mondo della fantasia (il cartone animato Les Triplettes de Belleville). Nella loro città soffia la Bora, un vento fortissimo (si dice sia per questo che a Trieste sono tutti matti). Ed è così che nel 2013 dispiegano ufficialmente le vele e salpano nel mondo dello Swing verso infinite avventure. Dal 2013 ad oggi Les Babettes si sono esibite in festival, eventi e convegni, tra locali, piazze e teatri in Italia e all’estero (Slovenia, Svizzera, Spagna, Cina) e hanno collaborato con emittenti televisive (Arte, Sky Arte, Rai 3, Sky, Cielo) e radiofoniche (Radio Deejay, Radio 105, Radio Rai FVG, Radio PuntoZero). Sono state ospiti di “Cuffie d’oro” a EXPO Milano 2015 e hanno aperto il Galà del Convegno Internazionale “Voce Artistica 2015” al Teatro Alighieri di Ravenna. Hanno suonato, tra gli altri, nei festival Swing Fest (Madrid, Spagna), Valsugana Jazz Tour (Pergine Valsugana), Trieste Loves Jazz (Trieste), Far East Film Festival (Udine), Bastianich Music Festival (Cividale), Friuli Doc (Udine), Sexto Vintage (Sesto al Reghena, Pordenone), China Shanghai International Art Festival (China). Insieme a Joe Bastianich e al suo progetto musicale, si sono esibite a Umbria Jazz e in vari concerti in tutta Italia e sono state ospiti di note emittenti radiofoniche nazionali. Per la Tv sono state ospiti della puntata sul Friuli Venezia Giulia nel programma “On the Road” – condotto da Joe Bastianich e andata in onda su Sky Arte – e in “Metropolis” – in onda su Arte, emittente europea di arte e cultura. Nel 2014 hanno partecipato alle selezioni di X Factor 8 Italia, ottenendo la Enel Green Light durante le Home Visit ed entrando quindi in ballottaggio per accedere ai Live Show del programma (in onda su Sky e Cielo). “Les Babettes” formed in 2011 in Triest, a small seaside city in the North-Eastern part of Italy with a fascinating background, both historically and musically. The name “Les Babettes” is actually a homage to this city. Inspired by the Triestin dialect, it comes from the word “babe”, meaning “the gossip girls”. With a touch of irony the trio took on this witty dialect word adding the “Les” and “-ettes” giving the name a French elegance and also celebrating well-known female vocal groups from both the past (such as The Chordettes) and the imaginary world (the animation Les Triplettes de Belleville). Triest is also well known for the Bora, an incredibly impetuous wind that blows from the North East. According to a common saying, it is due to this wind that there are so many “crazy” people in town! 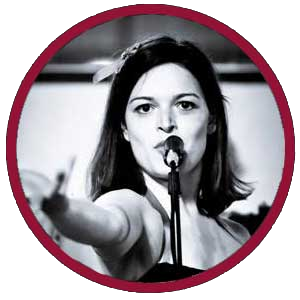 With help from this wind, Les Babettes set sail in 2013 into the exciting world of Swing. Since 2013 Les Babettes have performed in concerts, festivals and events in theatres, clubs and open air stages in Italy, Slovenia, Switzerland, Spain and China. They have collaborated with several TV channels (German and French Arté, Sky Arte, Rai 3, Sky, Cielo) as well as with numerous radio stations (Radio Deejay, Radio 105, Radio Rai FVG, Radio PuntoZero). They have performed at the Italian radio awards “Cuffie d’Oro” (EXPO, Milano) and in the gala concert at the international meeting “Voce Artistica 2015” (Ravenna). They have played, among others, at the festivals Swing Fest (Madrid, Spain), Valsugana Jazz Tour (Pergine Valsugana), Trieste Loves Jazz (Trieste), Far East Film Festival (Udine), Bastianich Music Festival (Cividale), Friuli Doc (Udine), Sexto Vintage (Festival Rockabilly, Pordenone) and China Shanghai International Art Festival (China). The trio have also joined Joe Bastianich (entrepreneur and judge for Masterchef Italia and USA) in his musical project and performed together at Umbria Jazz, in different venues all over Italy and on national radio stations. Les Babettes’ TV credits include “On the Road”, hosted by Joe Bastianich, broadcasted on Sky Arte, and “Metropolis”, the international artistic and cultural program transmitted on European TV Arté. In 2014 Les Babettes obtained the “Enel Green Light” at the final auditions for the Italian X Factor season 8 (Sky1 HD and Cielo) which afforded them the chance to reach the live show thanks to the public’s vote. Anni di violino sin dalla più tenera età le hanno dato delle solide basi musicali, ma la disciplina del conservatorio le stava stretta: molto meglio le evoluzioni sulla pista di pattinaggio, dove l’impegno e la costanza erano mediati dall’aspetto creativo dello sport. Lasciata la bella Verona è arrivata quasi per caso a Trieste, dove si è laureata prima alla Scuola per Interpreti e Traduttori e poi in Lettere Classiche. Il suo animo romantico ha trovato sfogo nel mondo circense delle acrobazie aeree… finché non è stata rapita da Lulù e Cocò, alla ricerca del terzo elemento per il loro audace progetto. Oggi lavora all’interno di una casa editrice di libri per bambini. Nel tempo libero la si può trovare con il naso tra i libri e una penna in mano, oppure sull’altipiano carsico alla ricerca di bruscandoli. Anna’s musical education began at a very early age with the violin. Despite enjoying the hard work and discipline of the her classical music training at the Conservatory, after a time Anna felt too constrained and felt she wanted to be able to express herself more freely as an artist… She chose figure skating as a new artistic outlet! She left Verona and arrived in Triest almost by chance, where she graduated from SSLMIT as a translator and, some years later, from University of Trieste in Classic Studies. Nanà’s romantic spirit led her to the world of circus and air acrobatics before she was ‘kidnapped’ by Lulù and Cocò, in their search of the third element for their audacious project. In her spare time you can find her reading books with a pen in her hand or looking for typical wild asparagus across the Karst. Inizia a esplorare la musica da piccolissima. Vista la tradizione musicale di famiglia, non era affatto strano trovarla davanti a un pianoforte o nelle fila di un coro di voci bianche sin dall’età di tre anni; vecchi filmati testimoniano il suo attaccamento ad un registratorino su cassette portatile che lei non lasciava mai… proprio mai! Dopo i diplomi in pianoforte e musica da camera, le esperienze nell’Orchestra Giovanile Italiana, i diplomi di CMT Estill Voicecraft e delle accademie di musical SDM e BSMT, ha lavorato sia come perfomer di musical (con la Compagnia della Rancia) sia come pianista classica (al Conservatorio di Trieste), pop (in tour con Udo Jürgens) e di musical (per la Stage Entertainment in Germania e Svizzera). E’ sempre in viaggio, e nella sua borsa non mancano mai un paio di scarpe da tango, computer e cuffiette per comporre gli arrangiamenti dei brani delle Babettes e un tupperware per uno spuntino. 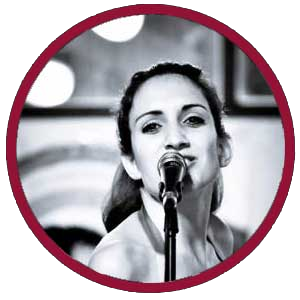 Eleonora started exploring music at the age of three. Since music has always been a big part of her family, it wasn’t a big surprise to find her in front of a piano or singing in a children’s choir at this early age. Childhood videos show that she would never let go of her handy tape recorder… never! After completing a Bachelor in classical piano, a Master in chamber music and two year experience in the Youth Italian Orchestra (OGI), she attended the SDM and BSMT musical academies, and also gained the CMT Estill Voicecraft diploma. 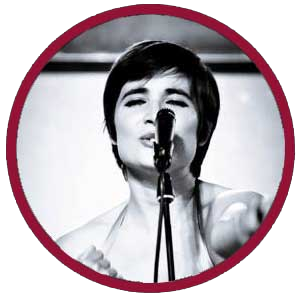 She has worked in the musical theatre industry as a performer with Compagnia della Rancia (Italy) as well as a pianist both in classical, pop and musical enviorments (Conservatorio G. Tartini in Italy, Stage Entertainment in Germany and Switzerland, Udo Jürgens’ tour “Mitten in Leben”). Lulù is constantly traveling; in her bag you’ll always find tango shoes, a computer on which she composes new arrangements for Les Babettes, and perhaps most importantly a generously filled tupperware box… for those spontaneous snack moments. È da sempre un’artista a tutto tondo, sin da piccola ha amato tutte le possibili forme dell’espressione artistica e negli anni le occasioni di studiare ed approfondire il mondo della recitazione (dal teatro al cabaret, passando per il cortometraggio e il cinema), della danza e del canto, sono state molte. Seguendo la passione nata tra le fila di un coro di voci bianche ha cantato in numerosi gruppi comparendo in diversi EP ed LP. È laureata in Arti Visive e dello Spettacolo allo IUAV di Venezia e alla Magistrale in Filosofia a Trieste. Lavora come insegnante d’arte, attrice e illustratrice. Ama viaggiare, leggere e stare in compagnia di buoni amici, possibilmente ballando una mazurka. Since she was a child, Chiara has loved art in all of its forms and has become an experienced all-round artist. Through the years she has gone into depth with all aspects of acting, dancing and singing, exploring theater, cabaret, short film and cinema. Following a passion born whilst singing in a children’s choir, Cocò went on to sing in several bands and is featured on EPs and LPs. Graduating in Visual and Performing Arts from IUAV (Venice) and Philosophy (Triest), she works as an art teacher and as an illustrator. She loves traveling, reading and enjoying good friends’ company, possibly while dancing a mazurka. Les Babettes hanno collaborato negli anni con diverse formazioni. Si sono esibite accompagnate da big band e dixie band (The 1000 Streets’ Orchestra, TEJO, Shipyard Town Jazz Orchestra, Walter Sax Big Band, Ragtime Jazz Band..), Mr. Wallace All Stars e da altre band formate, tra gli altri, dai musicisti: Riccardo Morpurgo, Matteo Alfonso (piano), Marco Vattovani, Igor Checchini (batteria), Andrea Zullian, Andrea Resce, Andrea Medeot (contrabbasso), Tiziano Bole (chitarra), Alessandro Peterussa (percussioni). Sono supportate dal fonico Ricky Carioti. Through the years Les Babettes have been accompanied by several bands. They have performed together with big bands and dixie bands (The 1000 Streets’ Orchestra, TEJO, Shipyard Town Jazz Orchestra, Walter Sax Big Band, Ragtime Jazz Band..), Mr. Wallace All Stars and other bands, including musicians: Riccardo Morpurgo, Matteo Alfonso (piano), Marco Vattovani, Igor Checchini (drums), Andrea Zullian, Andrea Resce, Andrea Medeot (double bass), Tiziano Bole (guitar), Alessandro Peterussa (percussions). They are backed up by the sound engineer Ricky Carioti. 2016/12/21 “Diario di un wedding planner”, season 3 episodio 7, Enzo Miccio – Real Time. 2016/12/21 “Diario di un wedding planner”, season 3 episode 7, Enzo Miccio – Real Time. 2015/03/15 Radio Free Station. An entire episode featuring Les Babettes. For more info about our events, please press here.